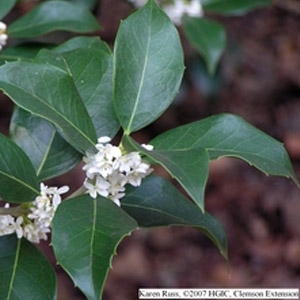 Tea Olives are some of the most sweetly fragrant plants in Southern gardens. Their scent makes them ideal for planting near windows and outdoor living areas where the fall blooming flowers can be readily enjoyed. Tea Olives grow as dense, evergreen shrubs or small trees. Leaves resemble holly leaves, explaining another common name, false holly. They can be readily distinguished from hollies by their opposite leaves, hollies having alternate leaves. Flowers of all tea olive species are intensely fragrant, often being compared to the scent of peaches, orange blossoms or jasmine. The most common flower color is creamy-white, but depending on cultivar, can vary to include pure white, pale to deep yellow, and orange.